The following is from this week’s National Weekly Message from FFYF Executive Director Sarah Rittling. You can subscribe to this weekly email from Sarah by clicking here. Each year, Thanksgiving offers a chance for us to express our gratitude for all we hold dear, and to reflect on special blessings in life. This week, FFYF is pausing to appreciate those who work day in and day out on behalf of our nation’s children. Early childhood experiences build the foundation for a child’s opportunities and achievements throughout their lives. 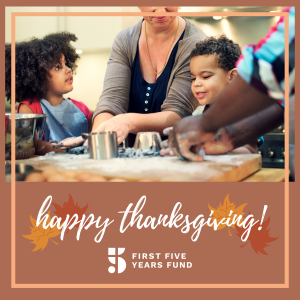 And we’re grateful to the parents, caregivers and teachers who are helping America’s infants, toddlers and preschoolers to learn and grow. 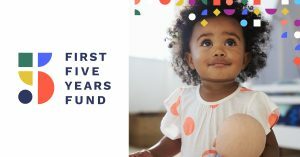 As advocates, we also celebrate the important efforts of policymakers, whose bipartisan commitment to quality early childhood education is making a real difference in the lives of children from birth through age five – particularly those living in poverty. Throughout the past two years during the 115th Congress, lawmakers and their staffs looked past today’s divisive political landscape and made historic strides in advancing policies and investments that will ensure more families have access to high-quality early learning and care opportunities. In fact, over the past decade, federal early learning programs have achieved steady, significant progress in increased funding and bipartisan support from Congress and the White House. We are also grateful for the promise that the 116th Congress brings. This month’s midterm elections reinforced early childhood education as a bipartisan issue that can unify lawmakers from across the political spectrum. And we look forward to helping new and returning lawmakers identify areas within the birth-through-five continuum of care and education where they can lean in and lead. All of this progress would not be possible if not for America’s voters, of course. According to FFYF’s recently-released aggregate polling report, Republicans and Democrats alike continue to overwhelmingly support early childhood education and the candidates who prioritize these issues. Lastly, I want to thank all of you for everything you do to advocate for kids. Together, we can make a real difference in the lives of young children, and I am so hopeful for the opportunities that lie ahead. Thanks for all you do, and Happy Thanksgiving! Interested in learning more about the importance of high-quality early childhood education and the progress that has been made at the federal level? Click here to access our 2018 Quality Early Learning and Child Care Toolkit, which provides research and data behind the need for early childhood education as well as policy and political opportunities to support early learning and care.